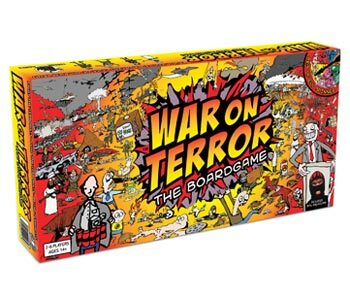 The goal of War on Terror, the boardgame is to liberate the world, ridding it of fear and terrorism forever. Naturally, only the biggest and strongest Empires are up to this task and so a certain amount of dominance needs to be shown. 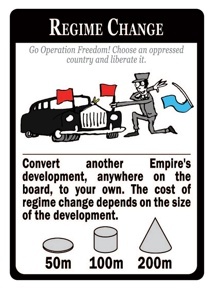 Alternatively, you can play as the terrorists, fighting for a world without empires. Empires soon strike up alliances and the propaganda war is in full flow - secret messages have been sold for over 100m in previous games. 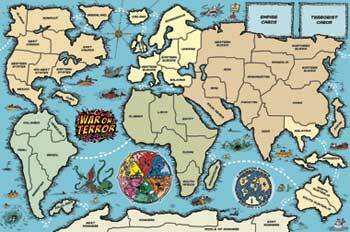 The games sway between paranoid pacts and all out war. Nukes get dropped and Empires soon find that sometimes you need to fund a bit of terrorism in order to eradicate a greater threat. Terrorists start to spread across the planet ... dirty bombs are detonated ... oil gets destroyed ... the world slowly becomes a dangerous, radioactive mess. 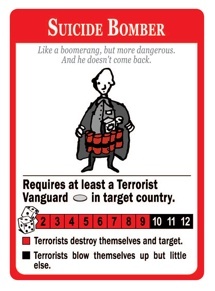 From its board (below), it looks a bit like Risk. Can't wait to start playing it.